An interesting and individual synth that is perhaps let down by its relatively high price. Depth of sequencing possibilities. The SID chip emulation. It doesn't sound like anything else. Tricky to tame. Small screen. Relatively expensive. The Monomachine takes a bit of time to master. 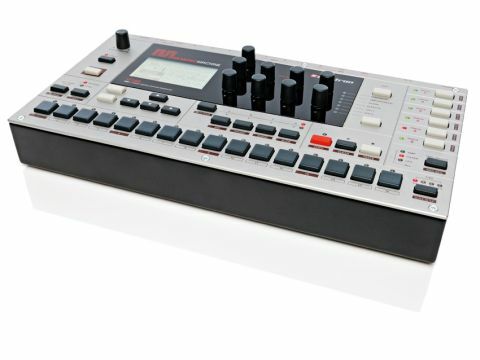 Elektron, maker of the Monomachine, is a Swedish company which first gained recognition for its SidStation synthesizer, which utilised the early '80s SID chip as its core sound generator. The SidStation was developed as part of a university project in 1999, and was followed by the now-classic Machinedrum in 2001. The original (MkI) Monomachine SFX60 (alongside its keyboarded sibling the SFX6) was introduced in 2003. The MkII version reviewed here arrived in 2007 and has seen a number of OS updates since then. The main functional difference between the original and newer incarnation is the ability of the MkII to host user waveforms (more on this later), but it is also smaller in height, has better signal-to-noise figures and balanced outputs. At its core, the Monomachine has six monophonic synth engines (all DSP-based, so no analogue here) associated with a sequencer track. There are also a further six polyphonic tracks provided for sequencing of external MIDI gear. Each Track in the Monomachine is independent from the others and is best thought of as combined sound generator and sequencer. The sound generation is determined by the type of Machine (synth or effects module) selected and is married to Amplification, Filter and Effect stages, alongside three separate LFOs. Each track is then routed to an output buss (or another Track) via a global envelope stage, where it can be sent to the Main or individual outputs. Tracks can also act as effects-only sections for processing other tracks, or audio from the two inputs. The most important factor in determining the overall sound of each track is the type of Machine chosen. There are five main types of synth Machine, which cover a range of oscillator and sound generation methodologies, with some sub-types that offer variations of the basic theme. First up we have the SuperWave, which is intended as an analogue-style tone generator capable of producing up to eight simultaneous waves (based around a sawtooth oscillator and a number of harmonically related square and sine waves). Two variations on this Machine offer pulse width modulation and four-note chord creation. The keyword here, though, is 'large'. The 'SID' Machine is based on the famous Commodore 64 SID chip which used a digital counter to derive its distinctive oscillator waveforms. There are also some interesting options for modulating from another Track. "The most important factor in determining the overall sound of each track is the type of Machine chosen." DigiPRO utilises raw digital waveforms (of which there are 32 12-bit variants), but there are also versions for playing back the 24 built-in drum samples (mapped across the keyboard) and combining waves to generate new content in interesting ways. FM+ is a customisable Frequency Modulation synthesis engine, and VO offers voice modelling (speech synthesis) by generating sequences of digitally generated consonants and vowels. There are also three GND Machines which generate silence, a tuned sine wave and Noise respectively. The second group of Machines is used for generating additional effects for use by the synth Machine or audio inputs. These include reverb, chorus, dynamics and ring modulation processing. All Machines pass through Amplification, Filter and Track Effects and can be modulated in numerous ways by the there assignable multi-waveform LFOs - and remember, this is before the sequencers come into play. The sequencing possibilities could fill up an entire article themselves, but needles to say, they go way beyond basic note-on/off step-time sequencing. Each Track actually has multiple events associated with it that can trigger or alter the Pitch, Amp, Filter and LFO sections separately. But the best things for us are Parameter Locks, which enable you to easily change synth parameters at every step of the sequence, for complete sonic mayhem. Remember that it's also possible to play the Monomachine from an external device as well as triggering other synths. Finally, there's a Poly mode that disables all but one of the Track Machines and increases polyphony to six notes. We found the Monomachine a tricky beast to tame at first. There is so much it can do in terms of sequencing and routing that it has quite a steep initial learning curve. This seems to be accentuated by the fact that much of its functionality is accessed through multiple key-presses and a comparatively small LCD screen that has to rely on abbreviations for many of the parameters. This is a particular issue when attempting to edit the factory Patterns, but becomes less of a problem when creating Patterns from scratch. Besides its functional depth, the other barrier to larger acceptance will probably lie with the price, pushing it out of reach of many potential users. Having said this, the results are highly individual and the Monomachine does encourage you to experiment in ways that would be impossible with most other synth/sequencer combinations. In fact, it comes close to providing what a large analogue modular system might offer, albeit with its own sonic character, and being a lot of fun to use.